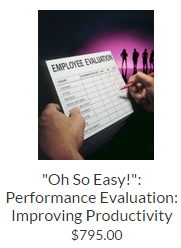 How to Improve productivity of your employees? Improve productivity of your employees and reduce the risk of having your company sued by training supervisors to act with professional skill and mature purpose in leading others. Help them deal with their attitude problems if they exist, and discover how to reduce complaints to the human resources office and surprise letters from attorneys or threats to have the EEOC contact you for employment law violations. How? The answer is with inexpensive and easy, but very intense, no fluff supervisory training that your require supervisors to complete and document accordingly with a certificate. This provides you with solid evidence of “duty of care” and proof that you took measure to prevent improper supervision practices. Many supervisors, both old and new, are without any formal training in their careers concerning how to manage those they supervise. This is a big problem because the ability to supervise others is a learned, critical skill. There are many pieces to this supervision training puzzle, but fortunately, they are all easily taught. There are keys to success—delivering the material to supervisors so they learn it, enjoy getting it, are impacted by it, can practically apply it instantly, and most importantly, have a way to recall, relearn, and access this information instantly when needed or required so they can apply it to an immediatet situation. Many organizations naturally believe that a simple ten or twelve minute supervisor training PowerPoint, or other educational tool with actors and scenarios offers the most effective training for new supervisors/managers. They are wrong. This is the worst sort of training to use because it violates every key element of usability and practicality discussed above. Human resources managers use this type of training do so at their own peril. Managers who are not trained must wing it, and fake it until they make it. There is only one problem with this approach, faking it by definition means errors in management and these errors can get someone injured, killed, or sued. Of course, supervisors can learn the topics of skillful leadership on the job discussed here, but how much supervisory mistakes can your organization afford? To avoid this risk which you will unavoidably face, get a solid training for new supervisors/managers that has extreme flexibility in its delivery options. These should include PowerPoint, PowerPoint with Sound/show; DVD; Video for a Web site, and a Web course loaded with handouts and supervisor tips and tip sheets with a certificate of completion. You have many options available to you besides supervisor training PowerPoint. And if your organization has scattered supervisors working on many shifts and in many locations, you will do well by having more than one format of supervisor training available to reach them, especially a web course that uploads to your server and that you actually own without ever having to pay fees or per user charges, and that is licensed permanently to you for internal use. Imagine for example, supervisor training videos—14 topics, and each one of them a four to seven minute module of a supervisor training topic? And on your Web site are 14 buttons that will instantly play the content 24/7. Once you purchase the program it is yours to keep. This is the only type of program you should purchase. Once this happens, then free supervisor training is available to your company forever. You do not have to rely upon free supervisor training that you scour the Internet to find, and that can only confuse supervisors with disjointed content. A DVD player format that has all 14 topics on it what about a web course that operates from your company server with the entire supervisor training outline of 14 skills included in it. All of this is only the beginning of the power packed into the “Oh So Easy Supervisor Training Course” offered by WorkExcel.com. Training new supervisors is essential if you are to have fewer employees quitting; if you want to reduce the risk of accidents from distractions and employee stress; if you want to boost morale; help supervisors understanding how to inspire and motivate workers so they will be more productive; and have better functioning teams that cooperate, bond, and deliver the right results the first time. Reducing the risk of workplace violence comes from better communication and fairness, helping supervisors understand how to document effectively, confront employees efficiently, and tackle conflicts with coworkers. Your supervisors do not need the skills of a weekend-hotel seminar pro, but the bare essentials are worth their weight in gold. Do you think that training supervisors can be done with a supervisor training manual plopped upon them with instructions to read? No way. What’s needed is initial education and solid awareness training with visual and auditory impact. After that, supervisors must be able to return to the supervisor training topics and the supervisor training outline they were given and study the elements, learn the skills again, hear the content and think about their application to their immediate situation faced in the workplace. The advantages of training supervisors are hopelessly lost on books and one-day training of new supervisors/managers. 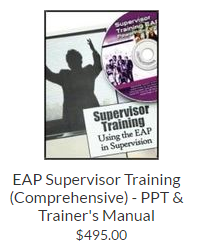 A supervisor training manual is valuable only if can have links to the specific skills available in online videos or materials you have placed on your Web site for managers to review quickly and easily. 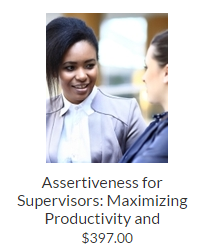 Don’t omit supervisor training topics like diversity, working toward fairness, ethics, observing employees and gauging effectiveness, speaking to employees and correcting their behavior, and sitting with workers to discuss their evaluation. These are all best learned by listening to a professional narrator discussing the content of the new supervisors managers course and then taking advantage of the resources included. If you believe that you can find suitable free supervisor training on the Web, and I want to ask if you understand that you only get one shot at educating supervisors with effective content, and you need something equivalent to a PowerPoint, video, web course, or DVD to do it. Supervisor grow numb with repetition, and want to train them right the first time. Also, you need and deserve some classic handouts on key supervisor training topics like how to document, how to avoid armchair diagnosis, avoiding enabling, and addiction in the workplace signs and symptoms, performance curves of addicts, a large list of work and performance problems for documenting, and tips for following up employees who have had corrective actions, especially those resulting from personal problems now resolved by some counseling or employee assistance program. These skills are not difficult to learn, but the key is having all the information about each one distilled down to only a few minutes of intense information that will capture the attention of supervisors causing them to retain the concrete essentials. What is it worth to your company to have the reduced risk and the many benefits, or even the absence of loss of life and serious injuries that come with improved supervisor training? Much more than free, I would imagine you would say. 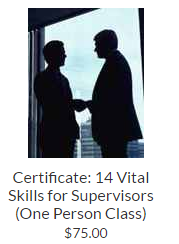 Skip additional research on supervisor training outlines and supervisor training definition and experience the 14 Vital Skills for Supervisor at WorkExcel.com. Here are the crucial supervisor training topics.